I love recreating popular treats from scratch. I mean, why go to the store when you can take all the credit for making everyone’s favorite branded treat? 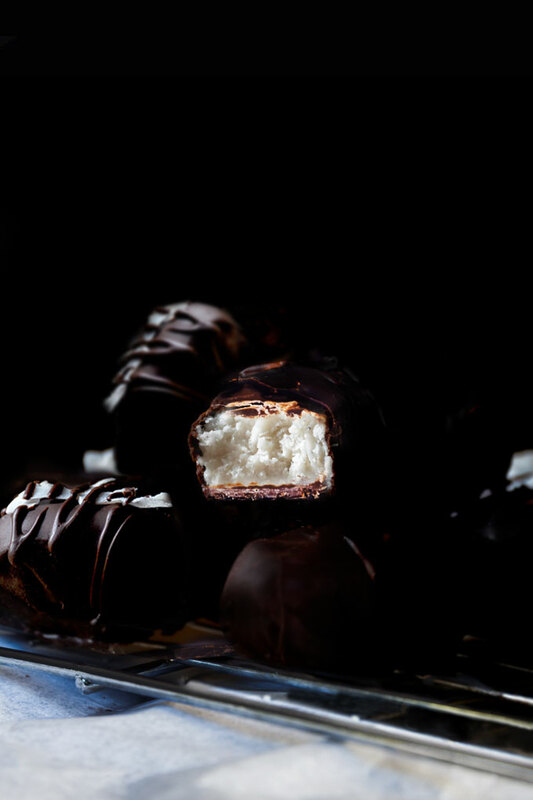 There raw Bounty bars are rich, coconut-y, and delicious – just like the “real” thing. With an irresistible combination of coconut and chocolate it’s no wonder that Bounty bars have been a classic confection for decades. Bounty bars and I have quite the history. As a little girl, I loved Saturday mornings. My parents would take my sister and I to a grocery store to stock our fridge and pantry for the week. After browsing through every single aisle of the grocery store (just to make sure we didn’t forget anything), we finally got to the check out line. That’s where all the treats were displayed at our eye-level. Since my sister and I both knew we could pick one treat, we always ran to see all the chocolate bars and candies available that day. I’m not sure why we felt the urge to see all the treats time and time again, especially since we both had our favorites. My sister would almost always reach for a Snickers Bar or a Twix Bar while I would go for a Bounty Bar. Being sure we both made our best pick, we handed the chocolate bars to my parents, excited to devour them as soon as we got out of the store. Desiccated coconut is a no-brainer. You need coconut meat for a coconut filling. I would highly recommend using desiccated (sometimes called macaroon) coconut because it’s the finest shredded coconut out there. It’s usually “powdery” because it’s in such small pieces, unsweetened, and contains no additives. You could use shredded coconut if that’s all you can find. 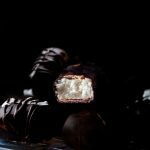 But the consistency of the coconut filling won’t be the same as in the original Bounty bars and might crumble. Perhaps a little bit harder to find, coconut butter is another essential ingredient in these raw Bounty bars. Coconut butter might be a little bit confusing because different brands call it different names. The common name is coconut butter, but it can also find it under the name coconut manna, coconut meat puree, coconut cream concentrate, or whole coconut flesh puree. Coconut butter is essentially pureed coconut meat (just like peanut butter is pureed peanuts). A more common ingredient is coconut oil. I don’t normally use virgin coconut oil, because it makes everything taste and smell like coconut. But as you might have guessed, virgin coconut oil is perfect for these Bounty Bars. So if you have it on hand, use it. Coconut nectar is a syrup that looks like honey but has the consistency of brown rice syrup. The taste is very difficult to describe. It’s almost like a very light maple syrup with a hint of floral. It’s quite pricey so if you don’t already have it on hand, substitute it with honey or maple syrup. Coconut cream is much thicker and more paste-like than coconut milk. You can either buy coconut cream itself, or use the cream that rises to the top of a can of coconut milk. The easiest way to separate the coconut water from the coconut cream is to put the can of coconut milk in the fridge overnight. After it’s sufficiently cold, the cream will rise to the top and the water will stay at the bottom. Also, stick with coconut milk that doesn’t contain emulsifiers and stabilizers (aka ingredients that inhibit the separation). For coating, you can use whatever chocolate you like. 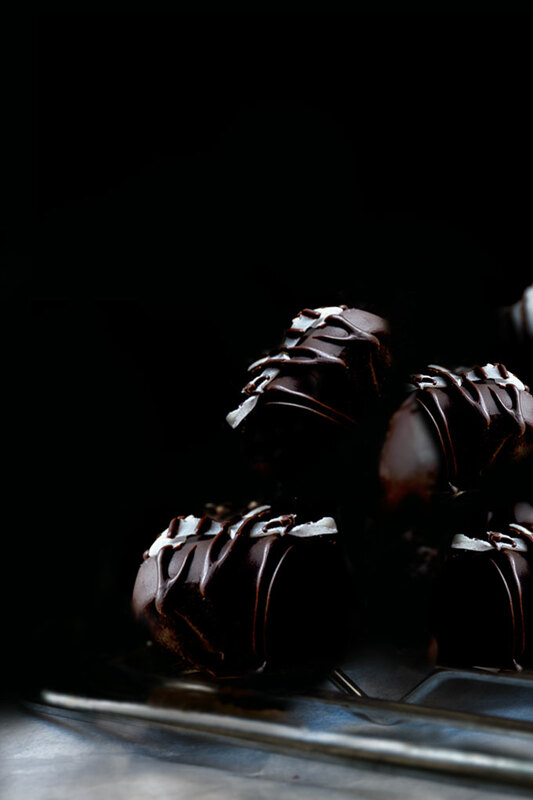 If you have time, try this homemade tempered chocolate. When shaping the bars, make sure you press the coconut filling together as much as possible. Believe it or not, it does make a difference in how compact the Bounty Bars stay after you take them out of the fridge. Also, if you have the time, try to make them look as much as the original. Stick with the same dimensions, round the edges, smooth out the surfaces … you get the point. 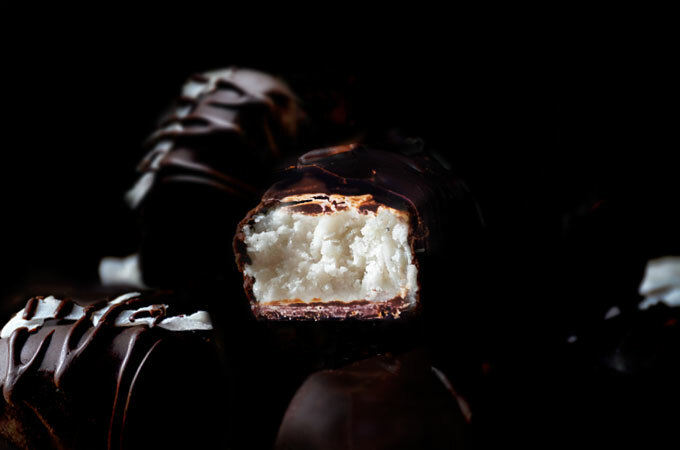 The colder the coconut filling is, the easier it is to coat it with chocolate. Once the warm chocolate hits the cold coconut filling, it hardens pretty quickly. So chill the coconut filling before covering it in chocolate. Homemade almost Raw Bounty Bars that taste just like the real thing. They're vegan, paleo, and the filling only consists of five ingredients. In a large bowl, combine all the filling ingredients, using your hands if necessary. Taste for sweetness and adjust if needed. Using your hands, shape the coconut filling into 12 bars, similar to Bounty Bars. Set them onto a parchment paper-lined plate and place them in the freezer for 15 minutes. In the meantime, prepare the chocolate. Whatever type of chocolate you're using, melt it in a double broiler. Let the chocolate cool just a bit so it thickens and you have a thicker chocolate coating for the bars. Remove the coconut filling bars from the freezer. One by one, place the coconut bars into the chocolate, turning them over a couple of times so every piece of the filling is coated in the chocolate. Remove the bars with a fork, allowing the excess chocolate drip back into the pot with chocolate. Then place the bars on a cooling rack. If using tempered chocolate, you can leave the finished Bounty Bars on the counter, letting the chocolate to harden. If your chocolate wasn't tempered, place the Bounty Bars in the fridge or the freezer for the chocolate to firm up. Store leftover Bounty bars covered in the refrigerator for up to 1 week. *Substitute coconut nectar with maple syrup (or liquid honey if not vegan). **This is the amount of coconut cream you get from 1 can of full-fat coconut milk. ***You can use any chocolate you like. I usually make my own tempered chocolate from scratch. Dear Petra, I made your perfect bounty bars! They are so yummy!! They turned out to be better than a manufactured one! I will make them again and again because I used to eat bounty in the past (when I ate refined sugar yet) and I loved them so much! I missed them and now I’m really happy that I can have a pleasure to taste them again so tasty and healthy as well! Thank you so much for your recipe!! !